What a Time to be a Black Woman in Film: My Experience at the Toronto International Film Festival 2018 — truly. From the success of films like Black Panther, and TV shows Insecure, Chewing Gum, and anything touched by Shonda Rhimes, there is no mistaking that black-focused content with strong female leads is on the rise. It might even be at its peak in the history of the entertainment industry. It’s an exciting time for me especially as an up-and-coming female African filmmaker, adamant about having Netflix buy the rights to my first television show. Too big a goal you ask? For me, it’s not big enough! 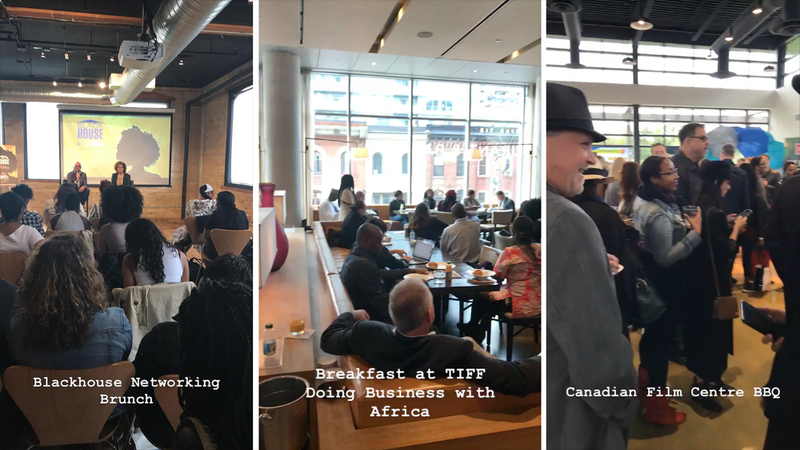 From September 6th to 12th, I was fortunate enough to take part in the annual Toronto International Film Festival as a delegate of Black Women Film! Canada. Each day was a fantastical sensory overload of conference talks, networking events, films, celebrities and parties that took me to a high from which I’ve not yet recovered. Some delegates of Black Women Film! Canada at TIFF 2018. From left to right: Angelyn Francis, Celestina Aleobua, Fiona Raye Clarke, Zipporah Yohannes, Isa Benn, Lameia Reddick, Ella Cooper (Founder) and baby, Christine, Sam, Barb Mamabolo, Rodas Dechassa. Not shown: Lu Asfaha, Alex Douglas, Dasola Dina, Carmine. A film directed by actor and producer, Adewale Akinnuoye-Agbaje, depicting his life story as a Nigerian, fostered in England, who grew up hating the colour of his skin. This film resonated with me the most being that I am a Nigerian who did not grow up on home soil. I was fortunate enough to see this film twice! Hotel Mumbai is about rippling terrorist attacks that occurred over four days across the city of Mumbai in 2008, with a focus on the events that transpired in the Taj Mahal Palace Hotel. The film reminded me of how society has become desensitized to a lot of these human-made disasters due to the sheer re-occurrence of them. I’m ashamed to admit that I’d even forgotten about the Mumbai attacks until seeing the film. However, the film did restore my faith in humanity, as it showed how many staff members at the Taj Mahal Palace Hotel risked their lives to save guests, and revealed that many of the surviving staff still work at the hotel today! “The Hate U Give Little Infants F**ks Everybody” states Tupac’s ‘Thug Life’ concept. This George Tillman Jr. film, based on a book by Angie Thomas, was heavily inspired by the aforementioned quote from rap legend, Tupac. The film is about the current day Black Lives Matter movement in the U.S., which a young girl joins after a police officer kills her best friend during a traffic stop. My favourite aspect of the film is that it doesn't follow the typical film plot: a climax following an immediate decline in action. Rather there are several climaxes from beginning to end, which in a way, mimics the unpredictability of real life. Papi Chulo is a sweet film about a weatherman grieving the loss of his partner. He finds himself in an unlikely friendship with a handyman that he pays to hang out with him. I loved this film because it touches on the importance of basic human interaction and how empathy transcends race, sexual preference, and socioeconomic status. There were countless industry conference talks scheduled throughout the week, a lot of which was quite insightful. 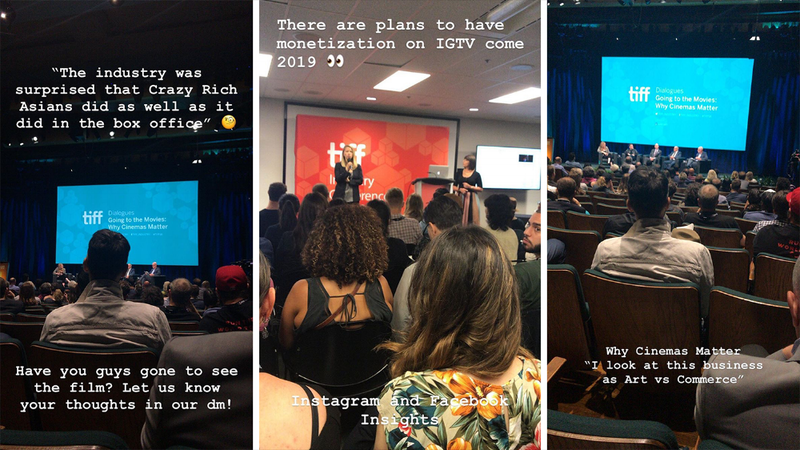 The biggest take away from the Facebook and Instagram talk is that there are plans to have monetization on IGTV by the year 2019! So if you’re a content creator like me and have just one video on your IGTV, best get to work, build your audience, and get ready to cash that cheque! The most valuable part of the TIFF experience was being able to attend several networking events and meet people in the industry that I can lean on for guidance and support. I finally feel that I am now a part of the industry and on my way to making a name for myself within it. The biggest networking event was the annual Canadian Film Centre (CFC) barbecue where they announced their partnership with Netflix! Remember that goal of mine? Not so far off after all, eh? What can I say, I don’t consider myself a celebrity fanatic (after all, we’re all human) but I was definitely excited to see Issa Rae and Viola Davis. These are two women paving the way for my future in the film/TV industry. Overall, this was an experience of a lifetime that came at the right moment in my career as a filmmaker, and I’m incredibly grateful. I want to thank Black Women Film! Canada for the opportunity, Truly Social for supporting my dream to attend the festival, and my siblings Irene and Felix Aleobua for being my wing-woman/wing-man at these networking events!